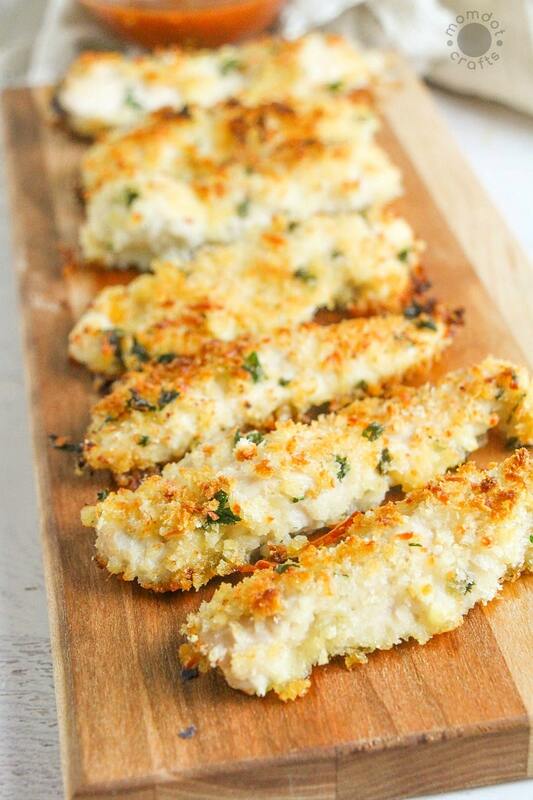 Baked Parmesan Crusted Chicken is perfect Friday night finger food. Covered in a perfect crust that is dip-able, you won’t be able to get enough of this crispy chicken recipe! Personally, when it comes to weekends, I am ready to take it easy on the cooking but I still want something delicious. That is where this Baked Parmesan Crusted Chicken will be your partner. I also don’t want to be tempted to hit up fast food in a last minute decision, messing up my waist line and my wallet. If you find yourself riding that very same line every week, make sure you put Baked Parmesan Crusted Chicken on the menu. It’s an easy and delicious chicken recipe that will give you all the temptation of great restaurant food, minus the guilt. This chicken recipe serves 4 – 6, depending on how hungry you are, and goes from fridge to table in about 40 minutes. 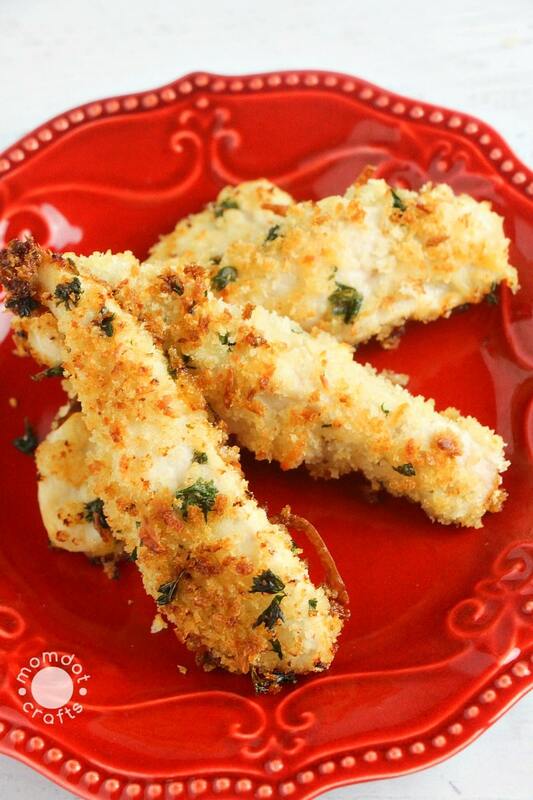 To get started on your Baked Parmesan crusted chicken, first preheat oven to 350 degrees. Chop up your parsley and garlic, which will help bring some delicious flavor to your Parmesan crust. Slice the boneless, skinless chicken breasts into “fingers” – cutting lengthwise and cutting thicker pieces in half again, for even thickness throughout. For even less cutting, consider using chicken thighs. 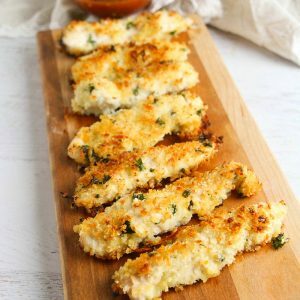 If you love these, consider trying my Keto Baked Chicken! Mix the breadcrumbs, shredded Parmesan cheese , parsley, salt, and ground black pepper together in a shallow bowl. This will be the base of your crispy Parmesan Crust! In a second dish, mix the butter (melted over medium heat), lemon juice and garlic together. Dip both sides of the chicken in the butter mixture, and then repeat with the crumb mixture until the chicken is fully breaded. Place the chicken in a casserole dish or cookie sheet , repeating with all chicken fingers. To keep the mess to a minimum for a dredging assembly line, line up your cutting board next to the dishes with the butter and crumbs, making sure you have no space between. Place your baking dish at the end of the line and voila! a neat and tidy dredge. Bake for 20-25 minutes until an inserted instant-read thermometer reads 165F. However, beware, the cooking time on this recipe can vary depending on how small or large you leave your chicken pieces. Full breasts or half breasts will take a bit longer than this, nuggets will take a bit less. 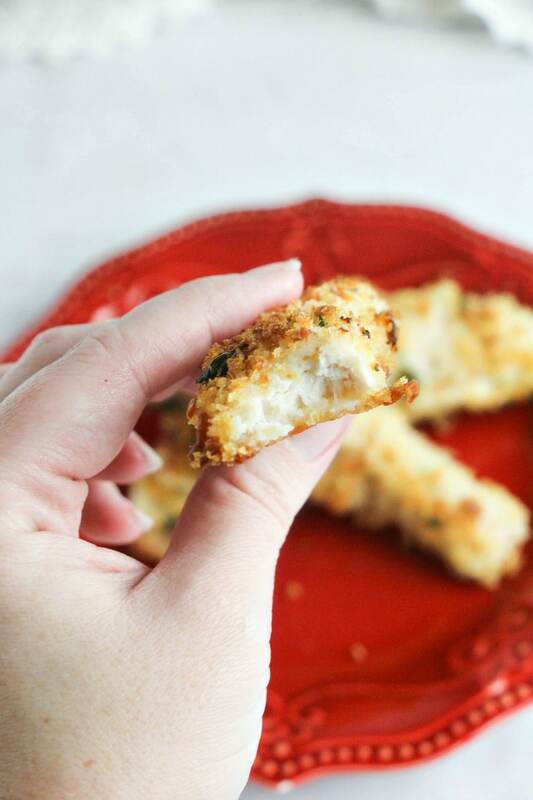 Option: Easily take this recipe baked chicken Parmesan and turn it into baked ranch Parmesan chicken by adding some of this! At my house we love to serve this with a caesar salad tossed with dressing, or over spaghetti with our favorite jarred sauce. It would also pair well with a side of mashed potatoes or veggies! Sometimes we forgo the pasta and just serve with marinara sauce for dipping. To make it a bit fancier looking, you can also sprinkle with a tablespoon of fresh parsley and thyme to add freshness and a bit of color. Chicken is a pretty major staple for a lot of homes. 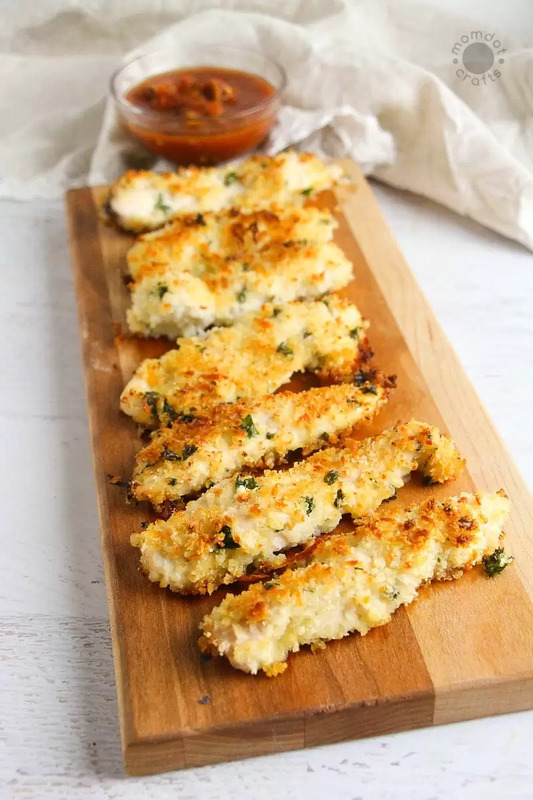 Hopefully with these quick tips, baking things like this Baked Parmesan Crusted Chicken will no longer be a great mystery in your house. Chop up your parsley and garlic. Slice the chicken into "fingers" - cutting lengthwise and cutting thicker pieces in half again, for even thickness throughout. Mix the bread crumbs, parmesan cheese, parsley, salt, and pepper together in a shallow dish. In a second dish, mix the butter, lemon juice and garlic together. Place the chicken in a casserole dish or cookie sheet and repeat with all chicken fingers. Bake for 20-25 minutes until an inserted thermometer reads 165F. Chicken is amazingly easy to make! This is a twist on a classic chicken fingers but done in the oven instead. The Parmesan helps the flavor and seals in a moist chicken. 0 Response to "BAKED PARMESAN CRUSTED CHICKEN RECIPE"